Join the rest of the Forum this Wednesday at Chats Palace for what might be one of the last Forum meetings in producing this plan. We’ll be discussing the Draft Policies and talking through next steps before the big public vote in the Autumn. We need as many of you as possible to come along on Wednesday, to take a look at these policies and consider how they might affect you and our neighbours in the area. By the end of the evening we want to make sure that we have talked through any policies that you think might be problematic or controversial and to have compiled your thoughts on these. The draft document will then be edited based on your feedback. We have policies in five main areas: Homes, Jobs, Shopping, Amenities and Movement. In order to make our time together on Wednesday as useful as possible we’d like to ask you to take a look through the DRAFT PLAN and write down 3 policies you particularly like and 3 policies you would like us to discuss more critically at the meeting. If you don’t have time to look through the plan you can look through the policy summary sheet. We hope to see you on Wednesday. We are excited to have the draft plan completed and we look forward to hearing your thoughts on it. After 3 years of hard work on the Chatsworth Road Neighbourhood Plan we have completed a draft of the Planning Policies Document! Time for us to reunite as a forum to make sure the Draft Policies make the right kind of difference, talk through next steps before the big public vote, and celebrate this milestone! If you can’t make the meeting, you can give written feedback on the document until the end of August, when we send it to Hackney Council to see what they have to say about it. We hope to see you on Wednesday 12th August at 7:30pm at Chats Palace to celebrate this important milestone together and to ensure that the document has your input before we send it to the rest of the community. Please email plan@chatsworthroade5.co.uk to confirm your attendance – and feel free to invite others living or running a business in the area to join the forum on the day. Our last Neighborhood Plan Forum meeting was in December 2013. Apologies it’s taken us so long to write everything up, but here are the minutes of our discussions and the documents we presented. We’re now refining these and we’ll post an update of the draft policies soon. You can find the minutes for the meeting here and our list of emerging policies here. If you want to formally join the forum, send us an email to plan@chatsworthroade5.co.uk with your name and address. You have to live or work in the area to qualify to be a member of the Forum. It’s important because you do not get a say otherwise till the plan goes to an area wide referendum run by Hackney Council. BUT DON’T WORRY we are a way away from that yet! So get in touch if you want to be more involved – we can do with all the help we can get as we finalise plans and proposals – including for individual sites in the area. We’ll let everyone know when the next Forum meeting is. Thanks to all of you who came to our workshops in February and March. We’ve finally managed to go through all your comments and get them all typed up. We had about 200 people come and contribute over 550 comments. You can read each and every comment under the relevant heading of Shopping, Getting around, Jobs, Amenities and Housing and you can see a map of roughly where all attendees live here. The next step will be to get together with the Neighbourhood Forum to see how we can translate these comments into policies which we can include in a draft Neighbourhood Plan. We envisage this to take a couple of months as we’ll need to look into what evidence we need to justify each policy and check we are compliant with Hackneys Local Development Framework. Once this is done we’ll give everyone that chance to look through all the policies we’ve written and vote on the ones you want to prioritize. 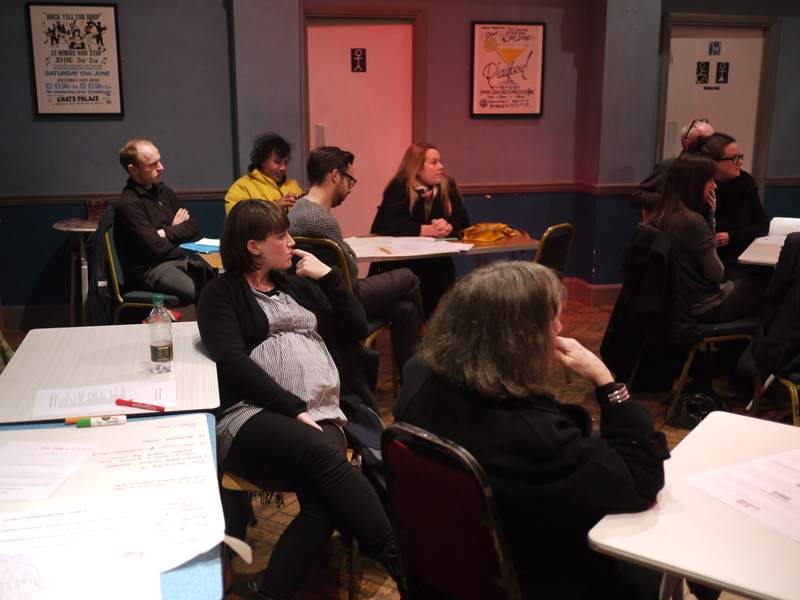 If you want to be more heavily involved with the forum and translating everyone’s comments into policies you need to join the Neighbourhood Forum and come to our next meeting. This is simple – just Email plan@chatsworthroae5.co.uk with your name and postcode and we’ll formally add you to the Forum. You should all now have received a flyer like this through your door. Let us know if you haven’t received one so we can chase up the guys that are distributing them. We look forward to seeing you all at one of the workshops! UPDATE: We have now submitted our application to Hackney Council. You can view and download our submission documents here. If you’d like to join the forum email plan@chatsworthroade5.co.uk. On the 16th of August we ran the first public meeting about setting up a Neighbourhood Forum for the Chatsworth Road area (see slides below). New powers under the Localism Act, allow Neighbourhood Forums to influence the way their area changes by producing a Neighbourhood Plan which sets out planning policies that Hackney Council will use when assessing any planning application within the area. The Forum has to include at least 21 people which are representative of the diverse interests of the local community and is open to anyone who wishes to join. There is no formal commitment but we ask you to be able to attend up to three meetings during the process. If you’d like to be part of the Neighbourhood Forum or know anyone who would be a good representative please email plan@chatsworthroade5.co.uk. The area that we’ll be applying for is focused on Chatsworth Road and is bound by Lea Bridge Road, Lower Clapton Road, Homerton Road and the Lee Canal, in essence the catchment area of Chatsworth Road . The first step in the process is to submit an application to Hackney Council for the Neighbourhood Forum and the Neighbourhood Area. Once this has been completed and subjected to relevant consultation by Hackney Council the the forum will together prepare a draft of the planning policies document (Neighbourhood Plan). Once this is done we’ll circulate it to the whole community to give everyone a chance to contribute and ensure the policies best reflect the community’s interests. Once all the comments and representations have been received and considered, we will write up the final document which will then be assessed by an independent inspector, to check the policies are sound in planning terms. The Council will then hold a referendum in the area so everyone can vote as to whether we want these policies to be formally adopted or not.